So, you are a college student with not-so-much money, but you want a bicycle. And one day, at the local thrift store, you spot a nearly-mint condition bike for $10 … ok, actually $9.99. 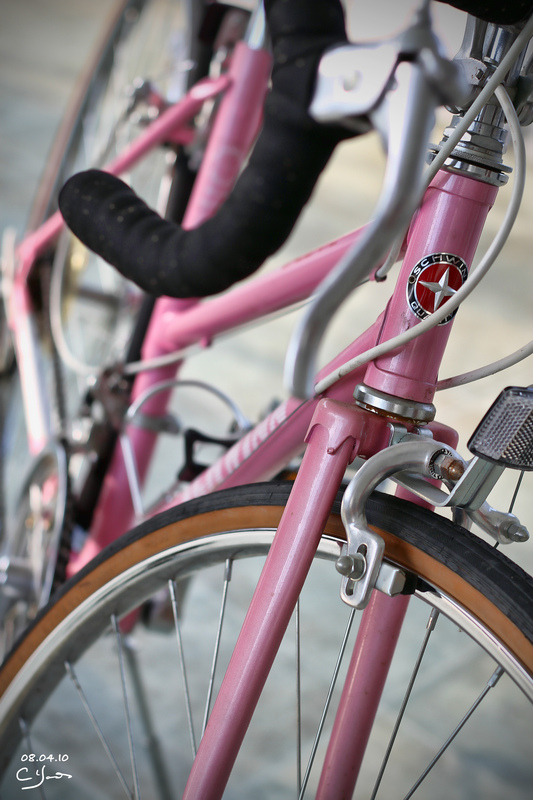 It is pink, a step-through frame, and there is no denying it is a girl’s bike. And you are a full-fledged-secure-in-your-maleness kind of guy. Immediately you know: this is your bike. A little bit about Matt … He has been a friend of all of the boys for a number of years, and has become like a member of our family. Spending time here, especially this summer, I like to think that our family’s love of bicycles and cycling has rubbed off a little. He’s a brilliant student, studying higher mathematics at Georgia Tech. He’s also an amazing cook (we joke that he should minor in culinary arts), a talented musician, and one of the kindest and most considerate young men we have ever known. He’s incredibly enterprising, conscientious and hard-working, and is definitely a free thinker. He said that the unconventional, and maybe “slightly bizarre” look of a guy riding a pink vintage-ish girls’ bike was an appropriate reflection of his resourcefulness and even his personality – for $10, how could he possibly complain? Honestly, it’s a beautiful bike – obviously garage-kept and rarely ridden. It’s perfect. And somehow, it is Matt. This weekend, Matt headed back to college. 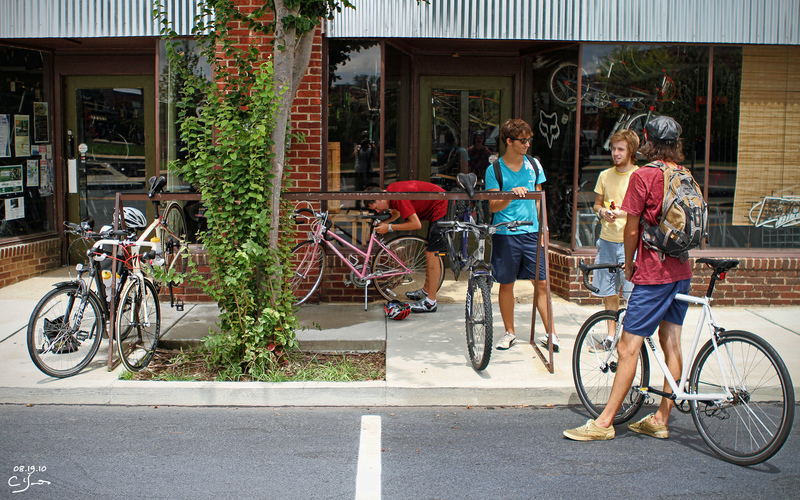 This semester, with a better (and pinker) way to get around campus and Atlanta. It makes me smile. Ride on, Matt – see you soon! Anytime a “discarded” bike gets new life is a moment of celebration. Anytime you convert another person to the cycling life is a opportunity for joyous satisfaction. The color of the frame is the least of our problems. Obviously Matt’s intelligence goes beyond mathematics. Nice balance. Another awesome tale from Cassi. Matt, I love your bike. 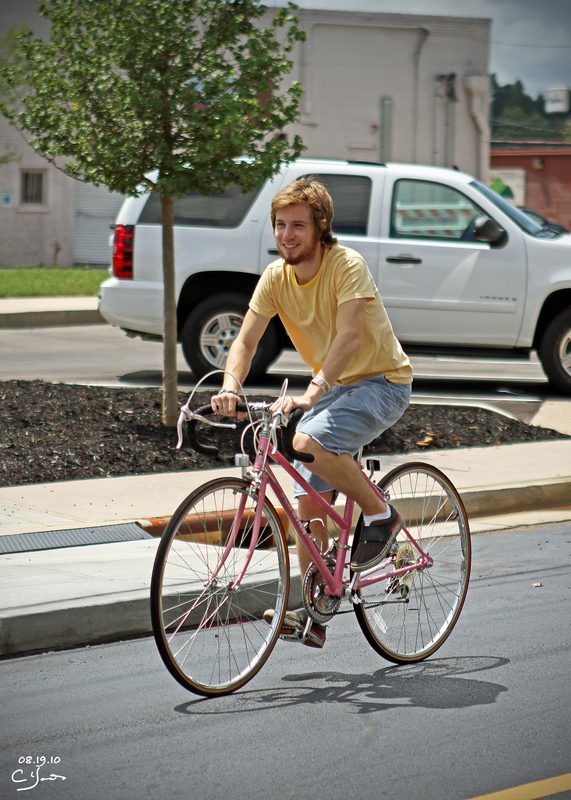 Have fun on your pink Schwinn Caliente. Love it. Love Matt (in a mom sort of way). Ever take it any sweet jumps? When I was 14 I sold my 5 speed spider bike and bought a pink 10 speed. Boys frame. It was the greatest. I hope Matt gets much enjoyment at GT from his totally cool and alternatively hip ride. Lock it up good! Whatever works! If I found a working bike for $10, I’d be riding it too! Got the same bike my dad brought it home from a job he was doing..not in as good condition as yours. I was skeptical about riding it, but once I hopped on I loved the thing right away!! !